← Walnutts FAQ’s: Hey, Can I Get A Copy Of That? The piece measures 9 ¾” by 13 7/8″ (including visible margins on all sides) and is framed for display in a simple, period, gold gilt surface wooden frame (overall size of framed display is 11 7/8″ by 14 7/8″). The image features a central, full-figured portrait of the conjoined twins surrounded by smaller, vignette images of scenes depicting the Twins in various daily activities. Included are views of Chang and Eng plowing a field, playing musical instruments, chopping down a tree, hunting, fishing, rowing a boat and driving a carriage. Also included are portraits of each man’s wife with their young children. The text below the images reads “’Chang’ and ‘Eng’ / The World Renowned United Siamese Twins. / Now Exhibiting At Barnum’s American Museum, New York.” The lithograph is copyright 1860 by the publishers and lithographers, Currier & Ives. Born in Siam (now Thailand) in 1811, Eng and Chang Bunker were connected at the chest by a five-inch-wide band of flesh. The location of this connection suggested to some doctors and other observers that the brothers shared a heart or some respiratory functions. These medical assumptions would later be proven wrong. In fact, it is believed that the brothers were xiphopagus twins, meaning they were joined only by a small piece of cartilage located at the sternum. The only organs fused were their livers, but each twin had a complete liver that could function independently. By careful practice, they were able to stretch their connective tissue enough for that they could stand side-by-side, rather than facing each other. This is what gave the “iconic” Siamese Twin look, where perception leads us to believe they are joined at the side, and which is the common depiction of this affliction. It is believed that separating Chang and Eng would have been very easy, even for the medical technology available at the time. According to their biography, the twins shared relatively “normal” boyhoods in Siam, running and playing with other children, doing chores, and helping to support their parents and siblings by gathering and selling duck eggs in their small village. Later, as teenagers, the twins left Siam and began a career traveling with two agents, Robert Hunter and Abel Coffin. Eng and Chang earned money by giving lectures and demonstrations throughout the United States, Canada, South America, and Europe. In fact, entries in their travel-expense journal document that they visited the campus of the University of North Carolina at Chapel Hill in October, 1834. 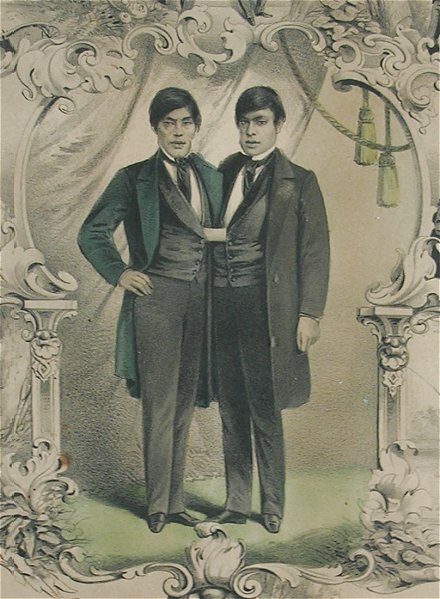 In their far-flung travels, Eng and Chang became such popular celebrities during the 1830′s that their promotion as “Siamese twins” were terms that were universally employed to describe connected or conjoined twins. By the late 1830′s, Eng and Chang grew tired of all their traveling, opting then to settle in North Carolina. There, the brothers married two sisters, Adelaide and Sarah Yates of Wilkes County. The sisters were of European ancestry and were neither twins nor connected themselves. The couples were married in 1843, and would ultimately produce 21 children between the two families. 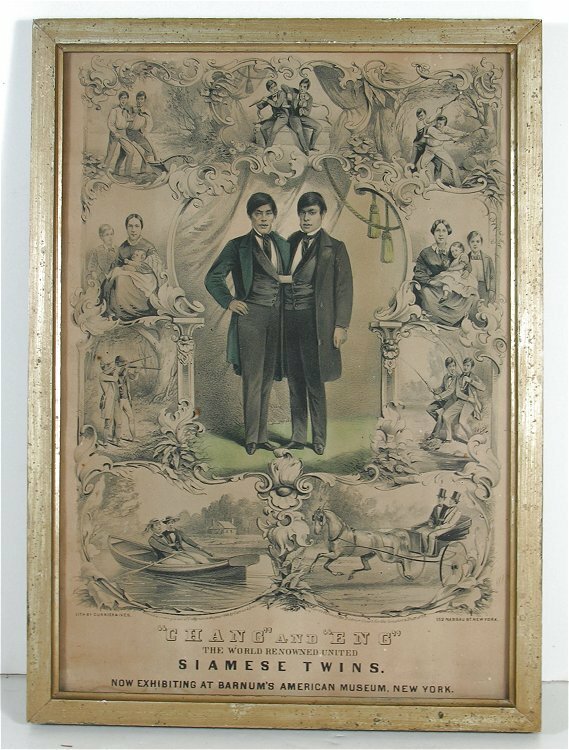 Although they had minimal dealings with P. T. Barnum, the master showman displayed a wax figure of the twins in the American Museum in the 1840s, published a pamphlet on their lives in 1853, and publicly associated himself with the brothers. 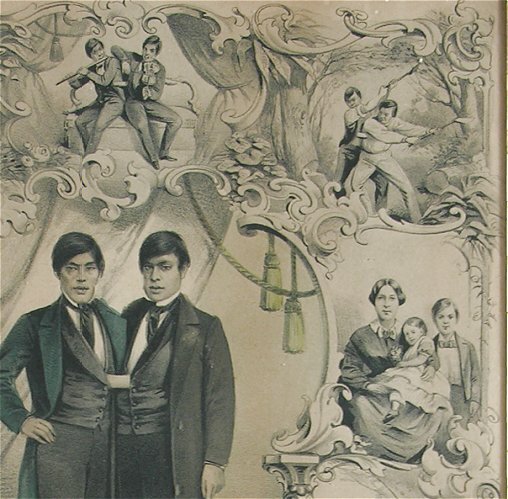 With large families to support, Chang and Eng returned to show business in 1860, agreeing to a six-week engagement at Barnum’s American Museum. This lithograph was issued to promote that appearance and was likely commissioned of Currier & Ives by P.T. Barnum himself. After suffering financial loses during the Civil War, the brothers again agreed to a European tour sponsored by Barnum in 1868, but these were the only times that they were in any way associated with P.T. Barnum. Eng and Chang died in January 1874, at the age of 63. Chang preceded Eng in death by about two and a half hours. An autopsy indicated that Chang died of a blood clot in the brain; and, at the time, Eng’s demise was attributed, understandably, to shock. This entry was posted in 19th Century, American Art, Collectibles: Printing, Daredevils Deviants and Circus Folk and tagged american museum, chang and eng bunker, circus, currier and ives, pt barnum, siamese twins, sideshow. Bookmark the permalink. Very useful info specifically the ultimate section :) I care for such information much.